Gartner: Case/Pallet RFID Still in "Trough of Disillusionment"
About 24 percent of Tier 1 retailers are running extensive RFID case and pallet tagging pilots or systems, according to Gartner, which predicts mainstream adoption is five to 10 years away. 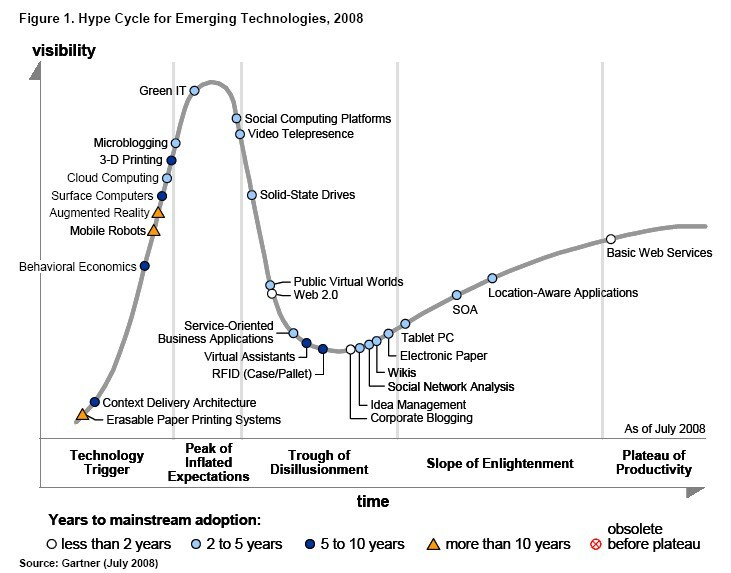 The firm placed RFID in the "Trough of Disillusionment" in its recently released "Hype Cycle for Emerging Technology, 2008" report. Aug 25, 2008—This article was originally published by RFID Update. August 25, 2008—The hype about RFID case and pallet tagging is abating, while pilots and implementations are growing, according to the latest assessment from global IT consulting and research firm Gartner. The company recently rated RFID and 26 other technologies using its well-known "Hype Cycle" methodology (see the graphic). Retail case and pallet tagging have descended from the peak of hype and are entering what Gartner calls the "Trough of Disillusionment," which is defined as the period in technology maturation when "Interest wanes as experiments and implementations fail to deliver. Producers of the technology shake out or fail. Investments continue only if the surviving providers improve their products to the satisfaction of early adopters." RFID's placement on the Hype Cycle for Emerging Technologies, 2008 report that Gartner announced last month refers only to retail case and pallet tagging, not RFID in general, UK-based Gartner analyst John Davison told RFID Update. This is an important point since it does not take into account areas like asset tracking, closed loop applications, and apparel item-level tagging that seem well on their way out of the Trough of Disillusionment. "Later this year we'll publish research on case and pallet tagging showing that about 24 percent of Tier 1 retailers are in extended pilots or beyond," said Davison. "Twenty-four percent is a large proportion. Even in these recessionary times, retailers are envisioning running high-level RFID pilots." The "Trough of Disillusionment" is a normal part of typical technology maturation cycle in Gartner's methodology, and doesn't necessarily spell a negative long-term outlook for retail case and pallet tagging. Gartner's Hype Cycles define five stages of technology maturity, from "Technology Trigger," where new technologies are identified, to "Plateau of Productivity," which signifies the beginning of mainstream adoption. The Trough of Disillusionment is in the middle of the cycle, and typically signifies mainstream adoption is between five and 10 years away. Gartner estimates current penetration of retail case and pallet tagging is between one and five percent worldwide. Despite the current high level of pilot activity, Gartner does not expect many Tier 1 retailers to widely deploy case and pallet tagging systems in the next two to three years. Many retailers plan to closely watch Wal-Mart's deployments and use those experience to guide their own projects, according to the report. Earlier this year Wal-Mart announced graduated tagging requirements for suppliers that will result in all cases and pallets shipped to its Sam's Club distribution centers to be tagged by 2009, with item-level tagging to follow. See Sam's Club Wants Item-Level RFID Tagging by 2010, Sam's Club Suppliers May Face RFID Fines from Wal-Mart and Wal-Mart's RFID Refresh for more information about Wal-Mart's plans. "People have seen what RFID can and can't do," Davison said, noting retail RFID's current position on the hype cycle does not indicate a major change in the firm's outlook for the technology. "Retailers do see the benefits of RFID, which is why there is the strong current activity level." Davison said Gartner's current RFID outlook is consistent with its previous forecasts. In February the firm publicly released its first market projections in several years (see Gartner Pegs Global RFID Market at $1.2B in 2008).